The debate over which hockey team is the best in the state of Utah will finally be decided on the ice this upcoming season. This year will mark the 1st Annual Wasatch Cup, which will pit Brigham Young University, the University of Utah, Utah State University, and Weber State University against each other to decide which college will reign supreme in the Beehive State. The annual tournament will makes its debut January 30-31, 2015 at the Salt Lake City Sports Complex in Salt Lake City, UT. The tournament will be set up much like the Beanpot Tournament in Boston, MA where the four local colleges play for the tournament title. There will be two semifinal games on January 30th. The pairings for those matchups will be decided by the third ACHA West Rankings, which are due to be released on December 15th. The highest ranked team will play the lowest ranked team in one semifinal and the second highest ranked team will play the third highest ranked team in the other semifinal. 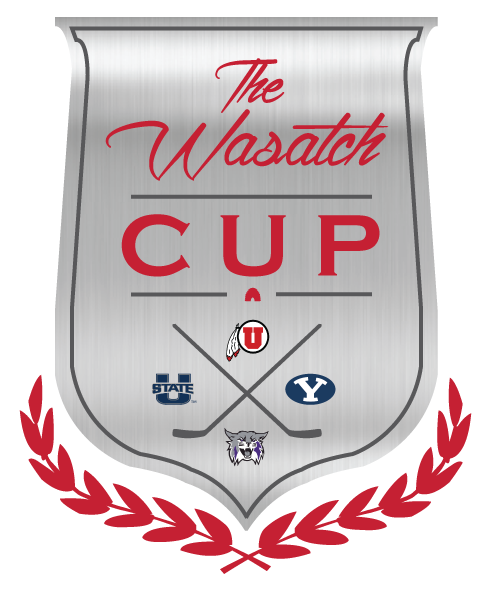 The two losing schools will play in a consolation game on January 31st at 5PM, followed by the two winning schools playing in the championship game to decide the Wasatch Cup at 8PM. With each team always playing a different amount of games against each other throughout the season, this two-day tournament is aimed to not only showcase college hockey in Utah, but finally put an end to the debate over which team is the best in the state.